I knew G took good care of our B but seeing him wipe her feet solidified it. I still remember G saying how B’s freckles come out even more under the sun so I think he loved taking that up close shot of B! @iampawsitive wrote: My mind is buzzing with thoughts again. Becca is so beautiful! And with that smile, straight up GORGEOUS! I wonder how Garrett does not melt into a puddle every time she smiles; because I would! That IG story of G wiping sand and water of B's feet and B saying, 'Get yourself a fiance like Garrett' is relationship goals. I loved how shy G was. He wouldn't look at the camera but I noticed that he never once stopped cleaning her up. My heart! Becca rocks that G-pendant everywhere and I wonder how emotional that makes her mom. Imagine yourself seeing your baby girl wearing that piece of jewellery everyday, knowing she is happy and enjoying life with someone who resembles your late husband in some his ways. How does that make you feel? Because I would be a complete emotional disaster! And, I would thank my guardian angel a thousand times a day. Uncle Chuck is in town and I love Garrett and him together. Nearly a year has passed since they met in the Maldives and I'm sure they have made many new memories together. But, the scene where they are talking on the couch, with drinks in their hands but tears in their eyes will always be special for me. I saw two men who loved their families and loved Becca enough to be emotionally vulnerable to each other, even though they were technically strangers. PS: I really hope Mama Jill and Uncle Chuck stay for B's birthday. It will be amazing if Emily flies in too! That would make Becca's day (maybe year)! Our girl turns 29 today. I am so grateful to her for showing the world how to always be respectful, elegant and poised at the face of adversity; for giving forgiveness a new meaning; for making second chances be real; for being humble, authentic and grounded in the world of fame & for always standing by (in life and SM) her happily ever after. So, here's wishing Becca the happiest of birthdays ever. I really hope she achieves everything she wants in her life. Awwww!! Garrett is he getting Becca a dog today!???? 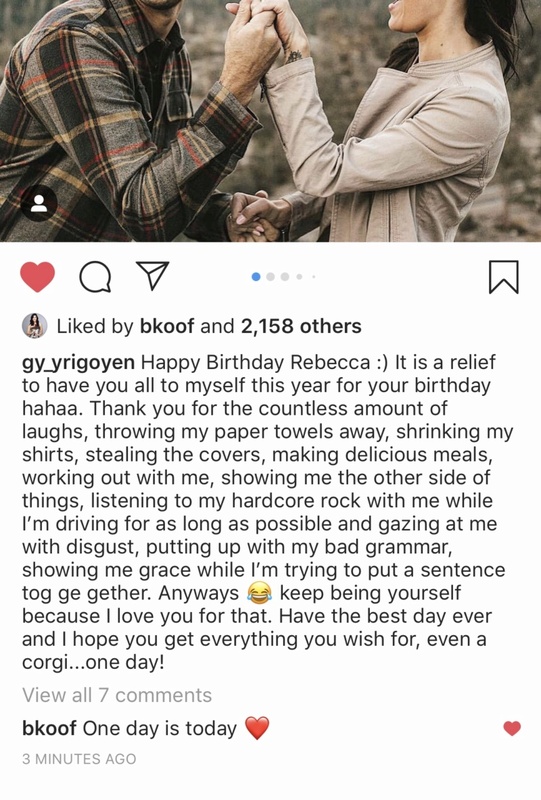 Is Garrett’s birthday post not the best?! I mean so cute and funny, self deprecating and sincere. They’re so true to themselves in everything they do. Love them! Happy Happy Birthday to our dear Becca!!! Wishing her the best of everything!!! Becca commented on her friend Briana's bday post about drinking together next weekend to celebrate so she's probably headed back to Minnesota soon. Love to see them happy and enjoy life tog ge ther . Happy Birthday Becca. I love that line! I just love them together . happy Birthday to our girl.